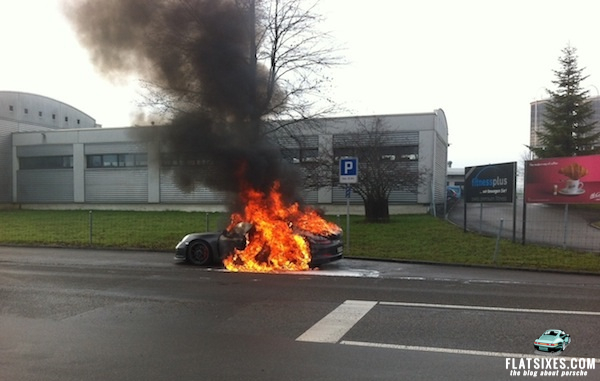 Late last week axisofoversteer.com reported on a Porsche 911 GT3 that caught fire in Switzerland and suggested that this wasn't an isolated case and that perhaps there were as many as five incidents in general (while only providing evidence of one other). Further, they suggested that "Porsche has suspended deliveries of all 991 GT3s" while the problem was investigated. This single blog post was then picked up by numerous other news and automotive outlets and run with some fairly sensational headlines, even though there was no confirmation from Porsche. Not wanting to jump on the rumor bandwagon we sent an inquiry to Porsche over the weekend and today, Porsche's Manager of Product Communications, Nick Twork, confirmed that Porsche has "asked dealers to stop selling the 911 GT3 until we can analyze reports of engine problems in a very small number of vehicles." As of now, there is no official information on what might be the cause of the problem or if there indeed even is a problem that persists across all units. As soon as we have more official information we'll let you know. For now, if you own a 991 GT3, or have one on order, you can contact your local dealer for more information.